Trump probably won’t crush legal weed. But he could do something worse. 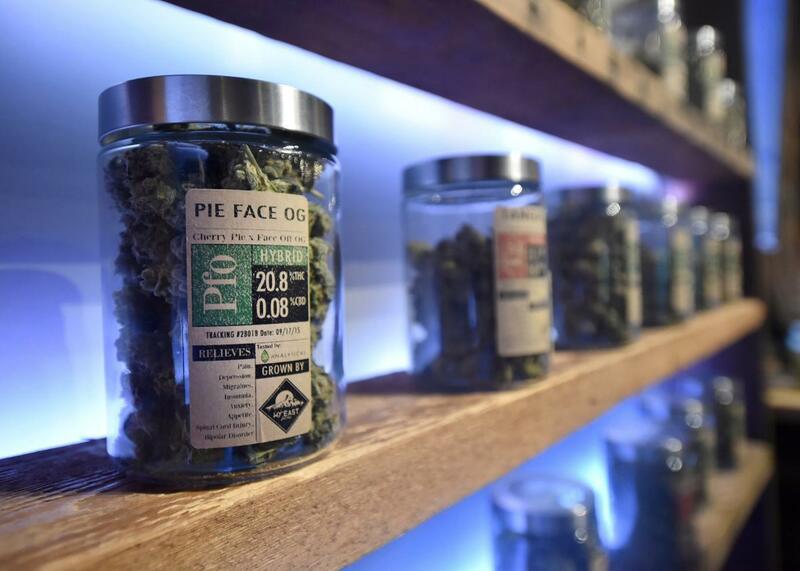 Products for sale at Oregon’s Finest, a marijuana dispensary in Portland, Oregon, on Oct. 4, 2015. In 2016, Americans bought about $7 billion of legal marijuana, roughly five times the 2013 total. Though the plant remains illegal in the eyes of the federal government, it is now the basis of what is arguably the country’s fastest growing industry. During his confirmation hearings, however, Sessions was noncommittal about the memo. In late February, White House Press Secretary Sean Spicer told reporters that while President Trump recognized the value of medical marijuana, he expected to see the Sessions Justice Department step up federal enforcement on recreational use. So what should we expect the White House and the Sessions Justice Department to do about marijuana—medical and recreational, legal and illicit? While the messages coming from the Trump administration have been jumbled, there are signs that it will leave legal marijuana, in all of its forms, alone while stepping up enforcement against illegal marijuana. That’s encouraging for a handful of states—and ominous in some less immediately obvious ways. For starters, the Cole Memo is probably safe, because to drop it and come down on the legal pot industry would disrupt the lives of a great number of Americans who think of themselves as law-abiding. Twenty-nine states have now legalized in some form, and polls show that most Americans favor full legalization, while huge majorities want medical use to be allowed. Legal marijuana is not yet a major industry by revenue, but the way it has developed—as independent, state-designed “experiments”—makes it difficult, politically, for any president to uproot. The most important reason is probably jobs. By one estimate, almost 123,000 Americans work full-time in cannabis. What’s more, many of these jobs, like the factory positions that Trump has promised to bring back, pay living wages to workers who don’t have college degrees. And since marijuana is illegal in most of the world, pot jobs are—for now at least—immune to outsourcing. The political map also favors legalization. Trump campaigned vigorously in Colorado in 2016, but Hillary Clinton won the state by 5 points. Trump’s revanchist message didn’t play well in Colorado—where I lived for most of 2015 and 2016—in part because it has one of the strongest economies in the country. One reason for that is legal marijuana. Last year, the essential swing states Ohio, Pennsylvania, and Florida all legalized medical use; in Florida it passed with 70 percent public support. A federal crackdown anywhere could delay the availability of legal weed in those states, as well as the accompanying jobs and tax revenue. Interfering with the rollout could have electoral consequences in 2020. Voters are unlikely to forget who took away their legal weed. The administration appears to understand this. Conservative radio host Hugh Hewitt recently suggested to Sessions that “One RICO [organized crime] prosecution against one marijuana retailer in one state that has so-called legalization ends this façade and this flaunting of the [Constitution’s] Supremacy Clause.” Sessions maintained that he opposes legalization but said, “I think it’s a little more complicated than one RICO case.” And this week Sessions essentially endorsed the Cole Memo. So, what did Spicer mean when he said he expected more enforcement of recreational marijuana from the Justice Department? First, it’s important to understand that Spicer’s distinction between medical and recreational marijuana is wrongheaded. In Colorado, the same companies grow and make medical and recreational products, following slightly different dosage and packaging requirements, and the products are often sold at different counters in the same room. In other legal states the categories are similarly blurry. Medical marijuana is also a more flexible term than Spicer implied: It includes California, where doctors give away recommendations after very brief video-chat consultations, and states like New York, where access is limited to a much smaller number of patients with significant medical needs. So what will the crackdown look like? The U.S. illegal market is roughly seven times as large as the legal one. In states that haven’t legalized or don’t yet have functional medical programs, it is the only source of marijuana. While legalization is supposed to undermine criminal activity, the illegal market still has a presence in legal states, and drug laws continue to be enforced. In 2014, the first year of Colorado legalization, juvenile marijuana arrests in the state were higher than in 2012. Arrests of black and Latino teens increased while arrests of white minors fell. During the Obama administration, there was a growing bipartisan consensus that nonviolent drug offenders should not serve long prison sentences. Sen. Jeff Sessions was a holdout who felt Obama granted clemency too promiscuously. Sessions may not be able to undo the Cole Memo, but after the relative peace of the Obama years, Sessions can reignite the war on drugs against illegal pot. What could result is a policy disturbingly in line with the ethno-nationalist themes laced through the rhetoric and plans of the Trump administration. For decades, drug laws have disproportionately punished racial minorities. Under the Cole Memo, the Trump administration could make the already–overwhelmingly white pot business, in effect, an apartheid industry; enormous marijuana farms could operate while renewed enforcement of the illegal market punishes minorities and immigrants for minor offenses. (This is already happening. And Sessions all but promises that more is coming.) Stepped-up prosecution of black and Latino citizens wouldn’t just disproportionately punish these groups, but also potentially suppress minority voting. President Trump is unpredictable, and it’s entirely possible that he will find a reason to pick a fight with legal marijuana. It seems more likely he won’t touch legal pot sellers—and gain their silence in return. Since it’s technically illegal, the president has enormous leverage over the industry which has already shown itself willing to cooperate. The pot industry is a jobs engine that won’t criticize Trump. They should get along fine.